OmniFlow Water Filtration System by Omnitec Design Inc. 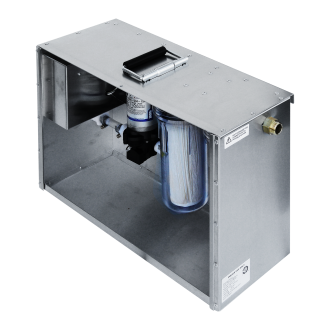 The OmniFlow water filtration system is commercial and industrial service system designed for purification of contaminated water at asbestos, lead abatement projects and similar sources at construction sites. Our portable system consists of self priming, positive displacement pump and two filtration stages with 20 and 5 micron filters. Omnitec’s OmniFlow water filtration unit is capable of high suction lift and 45 psi discharge pressure. 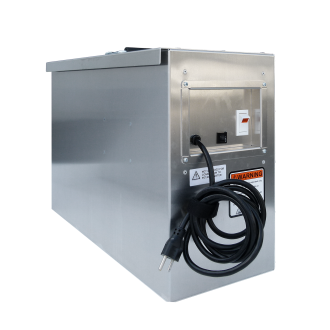 This portable unit has a strong aluminum housing with rubber grip handle and easily accessible hose connections. The OmniFlow two-stage filtration allows for the use of various filter cartridges to meet your requirements and comes standard with a 20µ and 5µ filter. Other specialized filters are available as required. Containment of the generated waste water fibers and debris is critical to proper compliance and worker safety. If contaminants are not captured and contained, they can be very harmful for the environment, on-site workers and the occupants of neighboring areas. Exactly how you approach your containment and capture solutions will depend on the individual site’s risk assessment report. Our pumps can operate dry without causing damage to the pump and are protected from thermal overload.